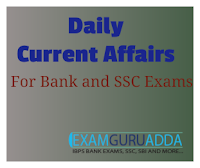 Dear Readers, we are presenting Daily Current Affairs for All Exams- 16th December 2016. 1. Assam government has launched ‘Sustainable Action for Climate Resilient Development in Majuli’ (SACReD, Majuli) to make river island Majuli country’s first ever Carbon Neutral district by 2020. 2. The project has been initiated by Assam’s department of Environment and Forest to combat climate change and reduce greenhouse gas emissions. It presents a vision and roadap for a carbon netural Majuli. 1. The UN cultural body UNESCO has accorded world heritage status to Brazilian city of Rio de Janeiro (nicknamed as Marvelous City). 2. It has been registered as “Carioca Landscapes between Mountain and Sea” on the UNESCO world heritage list. Rio de Janeiro has been accorded this status in recognition of its extraordinary fusion of man-made and natural beauty, soaring granite cliffs, urban rainforest and beaches. It also had hosted 2014 football World Cup and 2016 Summer Olympics. 1. Haryana became the first state in the country to launch Mahila Police Volunteer (MPV) initiative for safety of women. It was launched by Chief Minister Manohar Lal Khattar. 2. Mahila Police Volunteer is a joint initiative of Union Ministry of Women & Child Development and the Union Ministry of Home Affairs. 1. The Supreme Court has ordered a ban on all liquor shops on national as well as state highways to reduce drink driving and road accidents that claim thousands of lives every year across the country. 2. The three-judge SC bench headed by Chief Justice T S Thakur gave its order on a public interest litigation (PIL) filed by an NGO called ‘Arrive Safe’. The petitioner had mentioned that easy availability of liquor from stores on highways was a major reason for drunk driving. This results into around 1.42 lakh death annually in road accidents, many of which are caused by drunk driving. 1. The fifth edition of the India-Arab Partnership Conference was held in Muscat, Oman from December 14 to 15, 2016. Theme of the conference was ‘Partnership towards innovation and cooperation in IT’. 2. It was organised by the Oman Foreign Ministry, Arab League Secretariat in association with the Union Ministry of External Affairs of India. 1. The Union Government has extended the facility of e-Tourist Visa (e-TV) Scheme for citizens of 161 countries. It was announced by Tourism Minister Mahesh Sharma in a written reply to Rajya Sabha. 2. The reply also mentioned that number of foreign tourist arrivals on e-TV during January to November 2016 was 9,17,446. This period registered a growth of 168.5% over same period of previous year. This indicates success of the e-TV Scheme. 1. The Reserve Bank of India (RBI) on Friday instructed banks and other prepaid instrument service providers not to charge any fee, till March 31, 2017 for transactions charges up to Rs 1,000 using Immediate Payment Service (IMPS), USSD-based *99# and Unified Payment Interface (UPI) systems. 2. The temporary measures have been taken in view of the scrapping of old currency notes and to “incentivise greater adoption of digital payments by large sections of the society,” RBI said in its notification. 3. The measures will be effective January 1, 2017. 1. Offering black money holders one last chance to disclose their wealth, the government on Friday said they would have time until March-end to come clean by paying 50 per cent tax on bank deposits made in scrapped currencies since the demonetisation move on November 8. 2. Offering tax dodgers confidentiality and immunity from prosecution under the new tax evasion amnesty scheme Pradhan Mantri Garib Jalyan Yojana (PMGKY), which kicks in from Saturday, Revenue Secretary Hasmukh Adhia said non-disclosure of deposits made in banks after the demonetisation of old Rs 500 and Rs 1,000 notes will attract stiffer penalties, as well as prosecution.